Many people think it maybe an unnecessary burden to set up a monitoring system for their infrastructure. However this, when it comes to an OpenStack installation should be considered indispensable and required. Knowing which resources are used by which VMs (and tenants) is crucial for cloud computing providers as well for their customers from billing and usage perspectives. Customers want to be sure they get what they pay for at any time whereas the cloud provider needs the information for his billing and rating system. Furthermore this information can be useful when it comes to dimension and scalability questions. 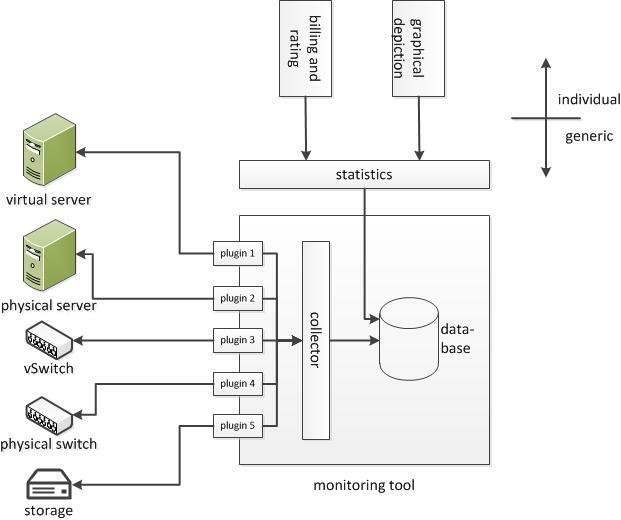 An OpenStack monitoring tool must be able to monitor not only physical machines but also virtual machines or network devices. The information of the monitored resources must be assignable to its tenant. The monitoring tool must be as generic as possible to ensure support of any device. The monitoring tool must offer an API. There exist a lot of tools for network and server monitoring like Nagios, Zabbix and Munin. Most of them do not easily support OpenStack monitoring. Zenoss is one of the few monitoring tools that supports an integration for OpenStack. It is possible to download and install an extension for OpenStack monitoring (https://github.com/zenoss/ZenPacks.zenoss.OpenStack). Unfortunately the latest version of this extension does only support the OpenStack API Version 1.1. The Folsom release ships with an OpenStack API version 2.0. The extension allows Zenoss to collect data only from a single tenant. That is not good enough because we need some more data to do rating and billing. Another promising monitoring tool will be included in the upcoming OpenStack release Grizzly (March 2013) and is known as Ceilometer. It will be part of the OpenStack core. Ceilometer makes it easy to monitor VMs belonging to a tenant. What Ceilometer cannot offer at the moment is physical device monitoring. After an evaluation we decided to extend Ceilometer to monitor the physical devices as well. With this extension Ceilometer will be able to monitor the whole OpenStack environment of the ICCLab and provide the data for further systems like the billing module.